The American Cancer Society (ACS) and RGF Environmental Group Inc. (RGF) announced that they work together on a strategic partnership to raise funds for cancer research and services in Florida. Through the Halos for Hope partnership, RGF will donate a portion of sales from two of their most popular IAQ products, the REME HALO® In-Duct Air Purifier and BLU QR® UV stick light, commencing June 1st through the end of November 2016. 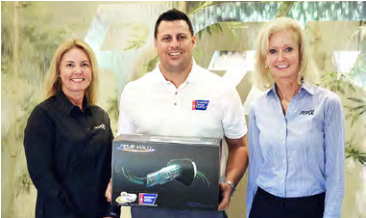 The American Cancer will receive a portion of the proceeds for each REME HALO® and BLU QR® sold by HVAC Contractors throughout the state of Florida. In addition, RGF is making available their corporate yacht, M/Y Envision, to assist the ACS in the fight against cancer. The first environmentally-friendly, 110 ft. motor yacht will serve as a venue for fundraising activities. “This partnership is a fit for RGF as we are first and foremost a research and innovation company striving to improve the quality of lives worldwide. Research is to eradicating cancer and continuing its funding is imperative. We are dedicated to this cause, because every one of us and our family members have been touched by some form of cancer”, stated Ron Fink, RGF’s President/CEO. These funds will stay in Florida and help citizens receive lifesaving services like Free Rides to Treatment, Free Wigs and Support Programs, Free Lodging, 24/7 Live Telephone Support, Research and so much more. Annual statistics reporting from the American Cancer Society shows the death rate from cancer in the U.S. has declined steadily over the past 2 decades. The cancer death rate for men and women combined fell 27% from its peak in 1991 to 2015, the most recent year for which data is available, translating to more than 1.7 million deaths averted during this time period. done by the American Cancer Society proves that 1-2 men and 1-3 women will develop cancer in their lifetime. Consequently 1-4 men and 1-4 women will die of cancer in the United States. Chris Snyder, Senior Market Manager, Community Engagement with the American Cancer Society of Palm Beach County said, “It is my pleasure to announce that the American Cancer Society and RGF will work together to put an end to cancer. Without the constant support of generous donations from organizations like RGF, we cannot fund research and provide lifesaving, services to the community. I take great pride in knowing that there are thoughtful organizations like RGF who believe in our mission to help people in every community stay well, get well, find cures and fight back.” About the American Cancer Society The American Cancer Society is a global grassroots force of more than three million volunteers saving lives and fighting for every birthday threatened by every cancer in every community. As the largest voluntary health organization, the Society’s efforts have contributed to a 20 percent decline in cancer death rates in the U.S. since 1991, and a 50 percent drop in smoking rates. Thanks in part to our progress nearly 14 million Americans who have had cancer and countless more who have avoided it will celebrate more birthdays this year. We’re determined to finish the fight against cancer. We’re finding cures as the nation’s largest private, notfor-profit investor in cancer research, ensuring people facing cancer have the help they need and continuing the fight for access to quality health care, lifesaving screenings, clean air, and more. For more information, to get help, or to join the fight, call us anytime, day or night, at 1-800-227- 2345 or visit cancer.org. About RGF RGF manufactures over 500 environmental products and has a 30+ year history of providing the world with the safest air, water and food without the use of chemicals. RGF is a research and innovation company which holds numerous patents and patents-pending for waste water treatment systems, air purifying devices, and food sanitation systems. To meet a growing need for indoor air quality improvement solutions, RGF developed both the patented REMEHALO® and BLU QR®. RGF’s Advanced Oxidation Systems are proven and tested to be extremely effective in destroying mold, odors, bacteria and viruses. Situated in the heart of the Port of Palm Beach Enterprise Zone, RGF Headquarters spans 7.5 acres, with 100,000 square feet of manufacturing, warehouse and office facilities. RGF has recently upgraded their facilities, creating an increased vertical approach to manufacturing, allowing the company to provide the highest quality and engineered products made in the USA. For more information, go to www.rgf.com/hope or contac RGF Environmental Group, Inc. 1101 West 13th Street, The Port of Palm Beach Enterprise Zone, Riviera Beach, Florida 33404 USA Tel: (561) 848-1826 or (800) 842-7771; Fax (561) 848-9454.